I use rotation surfaces in my model. Now it takes a long time to open and edit the file. What can I do about it? 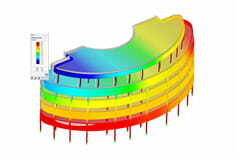 Rotary surfaces are usually used in the RFEM program to model and calculate simple geometrical facts. However, if you use a lot of them, you may experience performance interruptions, which is due to the definition of the surfaces, because in the background these have to be generated again and again over the boundary conditions when a change occurs in the system. Therefore, it is recommended to replace these surfaces with quadrangle surfaces, which significantly reduce the amount of data. In addition, it is also possible for these surfaces to apply loads only to parts of the quadrangle surfaces.